Egyptian Minister of Foreign Affairs Sameh Shoukry told his Ethiopian counterpart Workneh Gebeyehu on Thursday that Egypt is concerned about the slow progress of technical studies on Ethiopia's Grand Ethiopian Renaissance Dam (GERD), the Egyptian ministry said in a statement. Shoukry met with Gebeyehu in New York on the sidelines of the United Nations General Assembly (UNGA), with the two ministers discussing bilateral relations, as well as the ongoing dispute over the GERD project and its impact on Nile-water distribution. According to the Egyptian foreign ministry statement, Shoukry expressed Egypt's concern about the inactivity of the tripartite technical committee assigned to study the effects of the dam on downstream countries. 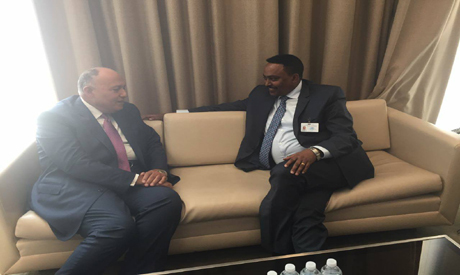 Shoukry said it was important for the ministers of Sudan, Egypt and Ethiopia to meet at the earliest opportunity to share the results of the technical studies, which have been agreed to by all parties. Minister Gebeyehu, meanwhile, stressed that his country is committed to the 2015 declaration of principles signed by Egypt, Sudan and Ethiopia, expressing his total understanding of the Egyptian concerns. Egypt has previously expressed its concerns over the delay in the results of technical studies, most recently in July. Shoukry is currently attending the meetings of the 72nd United Nations General Assembly, holding meetings with numerous ministers and heads of state while in New York.